Definition at line 35 of file llfloaterclassified.h. Definition at line 71 of file llfloaterclassified.cpp. 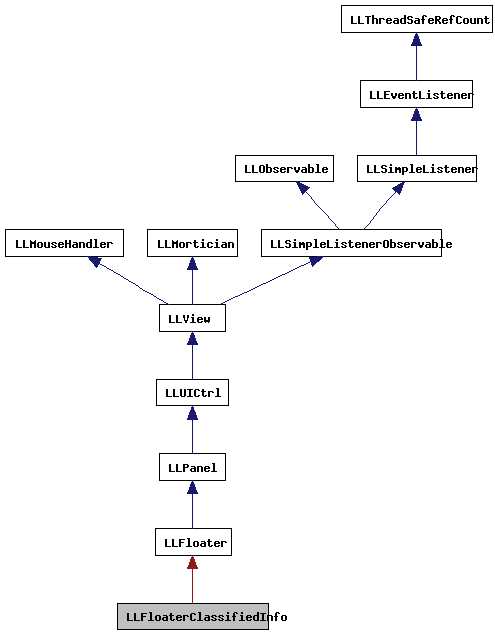 References LLUICtrlFactory::buildFloater(), createClassifiedDetail(), gClassifiedInfoInstances, LLPanel::getFactoryMap(), gUICtrlFactory, and LLPanel::mFactoryMap. Definition at line 80 of file llfloaterclassified.cpp. Definition at line 95 of file llfloaterclassified.cpp. Definition at line 87 of file llfloaterclassified.cpp. References mClassifiedPanel, LLPanelClassified::sendClassifiedInfoRequest(), LLPanelClassified::setClassifiedID(), and LLFloater::setFrontmost(). Definition at line 104 of file llfloaterclassified.cpp. 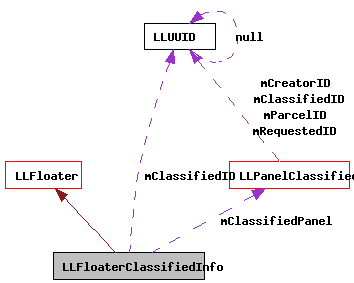 References LLFloater::center(), displayClassifiedInfo(), gClassifiedInfoInstances, LLUUID::isNull(), LLFloaterClassifiedInfo(), NULL, LLFloater::open(), and LLFloater::setFrontmost(). Definition at line 50 of file llfloaterclassified.h. Definition at line 49 of file llfloaterclassified.h.